32-bit DSP Technology Takes You Even Higher – To 144MHz ! This product is discontinued. Please check with your authorized Icom dealer for remaining inventory. Only Icom brings you Twin Passband tuning! Tailor your IF passband with the Twin PBT by electronically shifting the upper and lower IF passbands. Depending on the use of the concentric knobs, you can either narrow the IF passband, or shift the entire passband to eliminate interfering signals. Interference management is not a problem with the Manual Notch filter. With it’s incredible 70dB attenuation, the manual notch can eliminate a wide variety of QRM. The Automatic Notch Filter can track two or more interfering signals like Heterodynes and “Key uppers”! By digitally manipulating the incoming signal, the DSP is able to reduce various types of noise and enhances the receive signal components. Providing an outstanding signal to noise ratio to give clean, clear audio. Bring Hi-Fidelity to the amateur airwaves. The Microphone Equalizer will change your RST from “59” to “Great Audio” and “Nice Signal”. Adjust your audio for Bass and Treble characteristics to total 121 levels for all voice operation. The transmit filter width in SSB mode is selectable from 2.8/2.4/2.2kHz.The Rx tone control is also an equalizer for the received audio. As with the transmit audio, select the amount of Bass and Treble you need for the audio clarity you want. 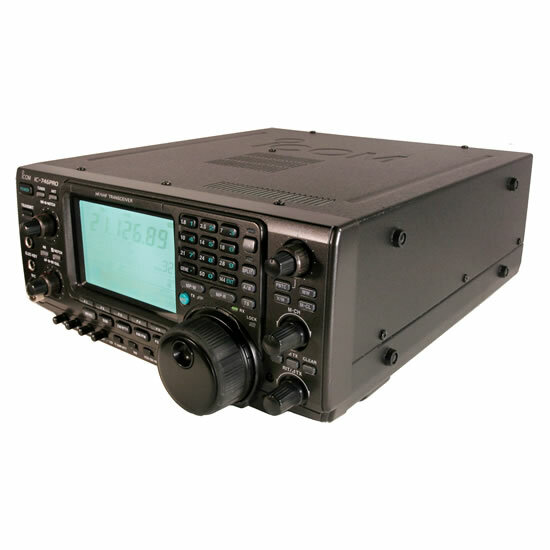 Covering all HF bands as well as 50MHz and 144MHz, the IC-746PRO all mode transceiver also includes a general coverage receiver from 0.03–60MHz and 108-174MHz* with full IF DSP capability. * Specifications guaranteed 0.5–29.99, 50–54 and 144–148MHz only. 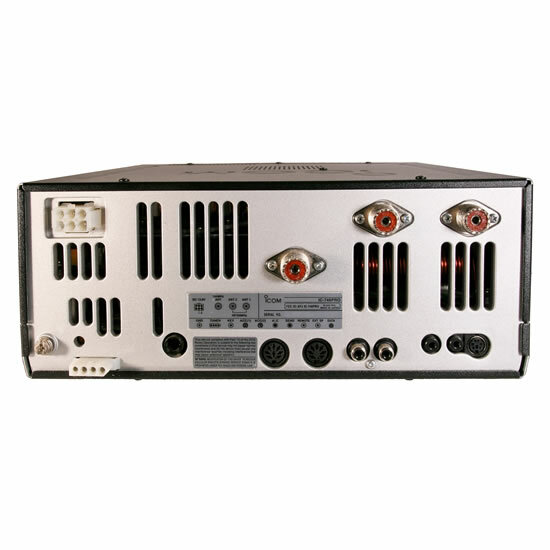 The bipolar 2SC2694’s are used to provide a clean 100 watts of output power for SSB, CW, RTTY and FM modes. (40W in AM). 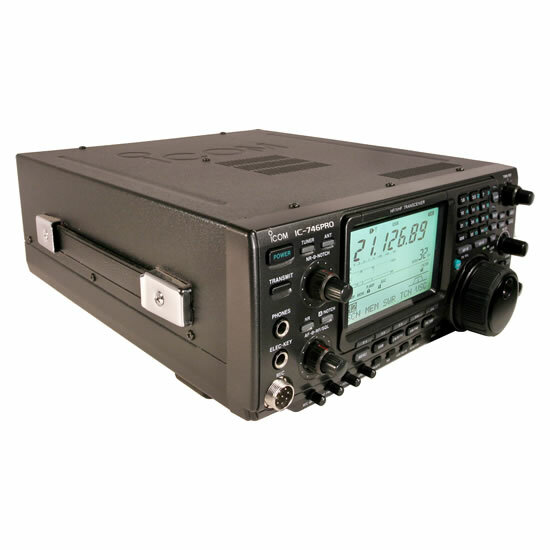 The die-case aluminum chassis and the variable speed cooling fan enables the IC-746PRO to transmit full power all the time*; the perfect companion for those digital mode contests. * On a 50Ω load at room temperature. The built-in RTTY demodulator and decoder reads baudot RTTY signals on the screen without turning on your PC or other gear. The RTTY tuning indicator helps critical tuning. The Twin Peak filter removes interfering QRM giving you a more accurate decoded message. Multi function electronic keyer, variable dot/dash ratio (2.8:1 to 4.5:1) and key speed (6-60 WPM), paddle polarity, bug key etc. CW pitch is adjustable (300 to 900Hz). Full break-in capability. Double key jacks – one each for front and rear panel. 4 channel memory keyer stores up to 50 characters with serial contest number auto-counter, morse cut number and auto repeat function. In addition, a user supplied external keypad* controls the memory keyer from your finger tips. * Not supplied by Icom. The internal antenna tuner matches the HF and 50MHz bands automatically. After operating on a band for the first time, the tuner memorizes the selected antenna and preset point providing for very high speed tuning. 2 antenna connectors for HF and 50MHz bands and 1 for 144MHz band is equipped on the IC-746PRO. You no longer have to worry about losing a CW signal while tuning with SSB mode. 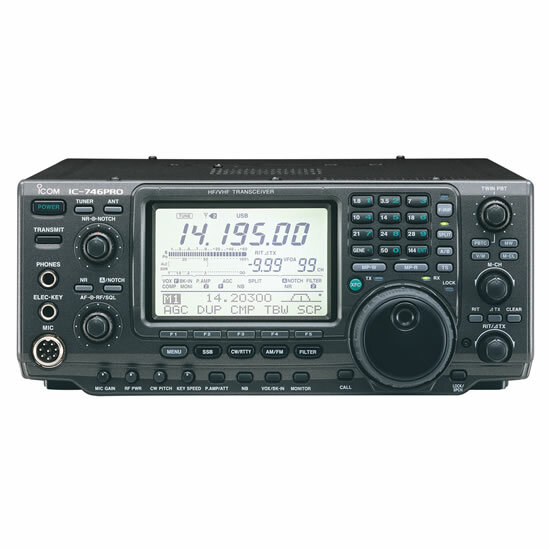 With the SSB/CW synchronous tuning, the frequency automatically shifts when you change modes. The Voice Squelch Control function opens the squelch only when receiving a modulated voice signal.